From voaspecialenglish.com | facebook.com/voalearningenglish MARTIN LUTHER KING: "I have a dream that one day this nation will rise up, and live out the true meaning of its creed." Civil rights leader Martin Luther King Junior helped to change American history. He led protests against racial separation. And he taught non-violence, even when threatened with violence. His efforts helped lead to the Civil Rights Act of 1964. MARTIN LUTHER KING: "Free at last! Free at last! Thank God almighty, we are free at last!" Four years later, King was murdered in Memphis, Tennessee. Now, a memorial on the National Mall in Washington will honor him. The memorial is set to open in August. Harry Johnson heads the Martin Luther King Memorial Foundation. HARRY JOHNSON: "I think we are overjoyed here at the Memorial Foundation. Knowing, understanding and believing that this is going to come to fruition. And that we are soon going to have a Martin Luther King Memorial here on our nation's Mall." The memorial will occupy land close to the Washington Monument and other famous memorials. HARRY JOHNSON:"We have a small water feature on each side of the Mountain of Despair." 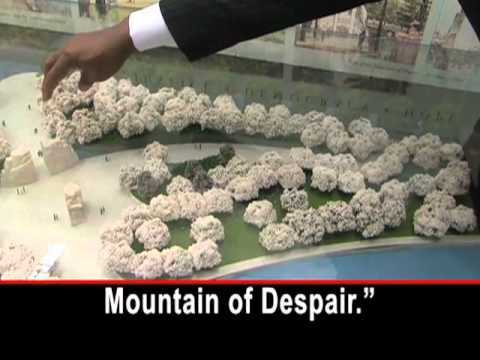 The memorial will have a 1,600-metric-ton granite structure called the Mountain of Despair and a 10-meter-high statue of King himself. HARRY JOHNSON: "This model was more of what is going to be there. You see he has a scroll of paper here." The granite marker is the work of Chinese artist Lei Yixin. Harry Johnson explains why the artist was chosen. HARRY JOHNSON: "We chose him because we really believe that Dr. King's message is true that you should not judge a person by the color of his skin, but by the content of his character. In these terms, we are thinking artistic character." Johnson says the memorial will be a powerful statement, and show how much progress the country has made in the area of civil rights. HARRY JOHNSON: "If America was as prejudiced as they say, then would they ever put an African-American on the Mall? And, the answer would be no. They said now the Mall is now diversified. Now we have an America that looks like America, when they look at the Mall. And I think visitors from around the world are going to say it is about time that you all understand who Dr. King really was and what he means, not to just America, but indeed the world." Johnson says President Obama has been invited to speak at the opening of the Martin Luther King memorial. I'm Mario Ritter. С видео For Martin Luther King, a Memorial in Washington Designed by a Chinese Artist изучать английский язык очень просто. I understand wanting the money to be used to feed, clothe or? educate black children or any color for that matter...truly I do. I must say though my heart smiles a bit when I think of that statue being there for all to see, it should have been done YEARS ago but we take what we can get. He was a beautiful man with a beautiful heart and a beautiful message to share and he shared it for as long as God allowed him to do so, he shared it with his whole being. God bless his children & wife. I agrred that $120 million will help so many kids black and white, however, this piece of history will last forever. Money is not everything,? you know? I'm an African American male and a huge believer of Dr. MLK's philosophies, but I think he is probably looking down at this very moment unimpressed. At $120m you could have given 500 black kids full 4 year scholarships or even built 10 community centers in the countries highest crime? areas. With all the schools, libraries, streets, postages and even a holiday, King will never be forgotten. Too many black kids are gunned down to spend money on such nonsense. This wont get us to the mountain tops.